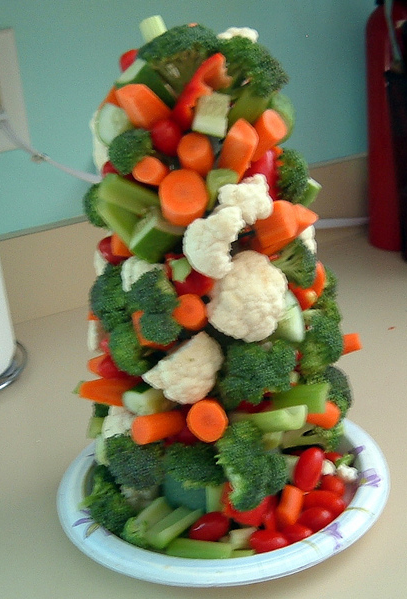 This veggie Christmas tree is a perfect way to serve veggies, and create a festive appetizer for your holiday party. Random other vegetables like cherry/grape tomatos, carrots, radishes, red peppers, cucumbers, celery -- any really! A sturdy serving plate/bowl that the cone will fit into with 3inches clearance around the base. Place Styrofoam cone onto plate/platter. Tear off a few sheets of tinfoil and wrap the angled sides of the cone up so the food isn’t directly on the cone. The tinfoil should stay on the cone by itself pretty easily, if not, use a piece or two of clear tape. DO NOT fold the foil under the flat base, it makes a wobbly tree. Either trim or leave loose and flatten away from the cone. Begin with the broccoli (and cauliflower if you want to mix things up). Cut the florets off of the really big stem leaving smaller stems of about 1-1.5 inches long. It usually worked best by sticking the toothpick into the broccoli, than sticking it into the cone. Start with the florets with the thickest stems first. Take the floret and stick it artistically into the cone, starting at the bottom and working your way up. Next, use cherry tomatoes, carrots, peppers..and so on. Serve with your favorite veggie dip on the side! Great recipe- thank you for sharing it!